In another era, the Nokia 2 would probably have been an Android Go device. 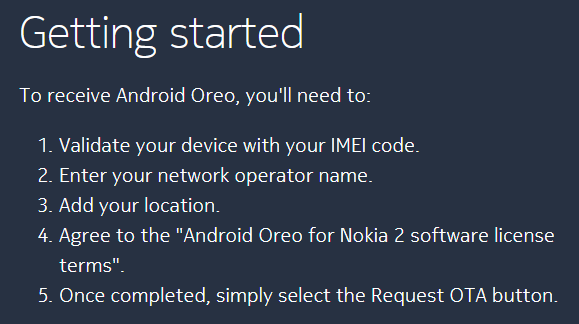 Since Nokia couldn't move the phone to Android Go via updates, instead they've cherry-picked specific memory management improvements, among other potential Go-related tweaks, for this Oreo update. On the page detailing the update, Nokia explicitly warns customers that not only will they expect reduced performance compared to Nougat, the update also isn't available for customers on specific networks as well as those in certain countries. In fact, you'll have to go to the announcement page and specifically opt-in to receive the update. If you haven't linked your device to your Nokia account, that means entering your IMEI, location, and carrier details. If you already opted in on the beta, you should get a notification about this latest version soon.